Michael can best be described as a kind-hearted‚ soft-spoken gentleman with an air of quiet confidence. His good looks and beautiful smile turned many heads and melted many hearts‚ yet he was never comfortable with the attention. He was a gifted athlete‚ excelling in baseball‚ golf‚ basketball‚ swimming‚ skiing‚ running‚ etc. He attended St. John’s University and played baseball there for four years. In 1988 he was named MVP of the Big East Conference‚ when his homeruns helped St. John’s secure a place in the NCAA Tournament. He signed with the Detroit Tigers organization‚ where he played pro baseball for two years. He was released because of injuries‚ never fully achieving his potential. 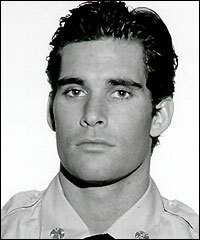 During Michael’s short life‚ he was a lifeguard‚ licensed physical trainer‚ and professional model. He joined the FDNY in 1994 and was a dedicated firefighter. He loved the job as all brother firefighters do. In his spare time he volunteered at the NY Burn Center‚ brought food to the homeless at St. Francis of Assisi Church‚ and got his exercise‚ mostly playing golf. On September 11‚ he was waiting for his tee off time at Forest Park Golf Course‚ when he saw what happened‚ when the first plane hit Tower One. He was on vacation but raced from the clubhouse to the firehouse‚ Ladder 24‚ Engine 1. From there he drove Fr. Mychal Judge and Captain Dan Brethel to the site. They arrived shortly before the collapse of Two Trade Center‚ and all three were killed. Michael’s sister Patricia worked for Morgan Stanley at Two Trade Center on the 72nd floor but managed to escape. This fine young man who was taken too soon will always be remembered as a peaceful and caring person‚ whose smile would brighten your heart. We will always love you and miss you and until we meet again‚ may you rest in peace. I walked in your honor today at Red Rocks amphitheater in Morrison Colorado. Thank you for your service and you will never ever be forgotten! Michael Thomas Weinburg, I walked in honor of you at Bay View Middle School in 2016 – Never Forget. Michael- I walked in your honor today at bay view middle school. Never forget. I climbed in your rememberance today at Bay View Middle School-2016 – never forget. My name is Marvell Johnson and I climbed in your honor of 9/11 at Bay View Middle School 2016. Never Forget. FF Michael . I ran in your honor today at Run For The Fallen Wisconsin 9/9/17 . Full Turnout gear. Today you and your brother and sister firefighters are remembered. ? On 9/10/17 I had the privilege of climbing in the Nashville, TN. Memorial stair climb for Michael. I climbed 112 floors in him honor. Mike it’s that time of year when I think of you and others from the job and the neighborhood that were taken from us. Mike you were the best of the best, THE NATURAL. I knew you when you were in 2nd grade playing on my brother’s little league team. You turned into a great young man. Thank you so much for your dedication service. May you Rest In Peace. Remembering September 11th and Honoring Fallen NYFD Hero Named Michael Thomas Weinberg.